Coffee in a bean can not be compared with the soluble beverage is a ritual and religion, deliberation and enjoyment of the cooking process. Grinding grain is also better manually and not in an electric grinder, so you save unsurpassed flavor and authenticity of the product. Please be real and Turka with a wooden handle. There are special sets with the roaster and sand for making real coffee inTurkish. By the way, it is a good gift idea for the coffee lover! But if you don't want to spend money on this kit, there is a cheaper option. Find a regular cast iron pan, preferably deep. Remove the quartz sand, it is possible to produce in the glass factories or companies that sell equipment for coffee shops and restaurants. The preparation of coffee is not vanity and carelessness. If you bring the drink to a boil, pour it without regret! After reaching the liquid temperature 98-99 degrees in coffee, an irreversible process, starts the release of harmful to human stomach acids. Pour sand into the pan and place on plate. Heat an empty Turku on the sand and pour it coffee fine grinding. Ground coffee is not stored for a long time, so prepare exactly as much product as you need at the moment. A little warm the powder in a cezve, do not overdo it. In boiling water put the sugar and spices and pour the icy water. Get eights and circles Turka on the hot sand to the drink is not boiled. Approximately every two minutes stir the grinds with a spoon. Monitor your coffee as soon as he got up and there were bubbles on the walls, the Turks, the drink is ready. Carefully pour it into the hot Cup. In brewed coffee add a teaspoon of ice water to the sediment has settled. Do not drink this drink on an empty stomach it can cause heartburn and systematic use of stomach ulcers. 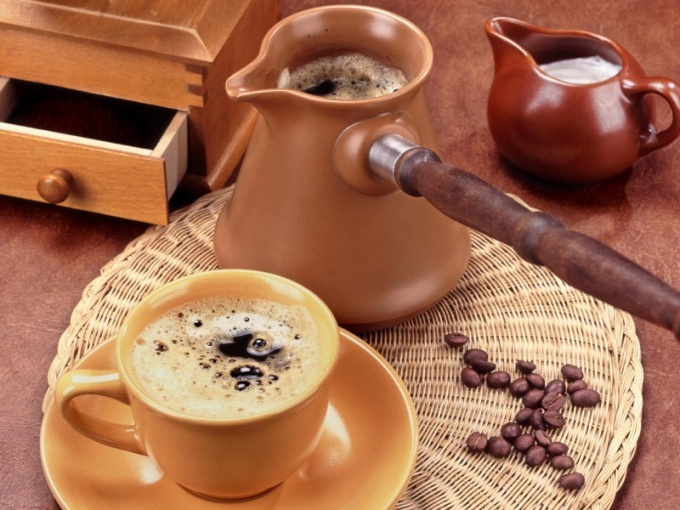 Serve Turkish coffee without a spoon, it is impossible to stir. Try making coffee from ground beans in the following the original recipes. Preheat Turku on the fire, stir into it 1-1. 5 gram of black pepper and four teaspoons of freshly ground coffee. Stir and pour 100 ml of very cold water. Bring to the boil and add another 150 ml of water. This mixture, too, bring to the boil, add another 250 ml of water and simmer for 5-10 minutes. Pour the "coffee with pepper" in hot cups. One liter of water bring to a boil, add to it 4 tablespoons of ground coffee and 80 grams of sugar, stir and let the drink a little brew. Pour him a Cup. Pour 80 ml of rum, or pure alcohol in a ladle and ignite. While the fire is burning, pour the contents of cups of coffee. "Hot coffee" will warm you in any frost! Pour one tablespoon of freshly ground coffee and sugar to taste 100 ml of water. Add anise, allspice or cardamom that there house. But Cayenne pepper on the tip of a knife is a mandatory component of coffee is Kenyan. Then boil the drink, as usual. Serve coffee in small warmed cups.